The Christine Haynes Sassy Librarian Blouse was laying on a shelf for about three years. It was purchased soon after the time I decided to make all my own clothes. This Chanel style jacket is the start of my 100% handmade wardrobe. My mother wasn’t a sewer. She loved knitting. She made some clothes for me and used sewing magazines. When I decided three years ago to make all my own clothes this also meant my introduction with Indie pattern makers. One of the patterns that caught my eye at that time was the Christine Haynes Sassy Librarian Blouse. 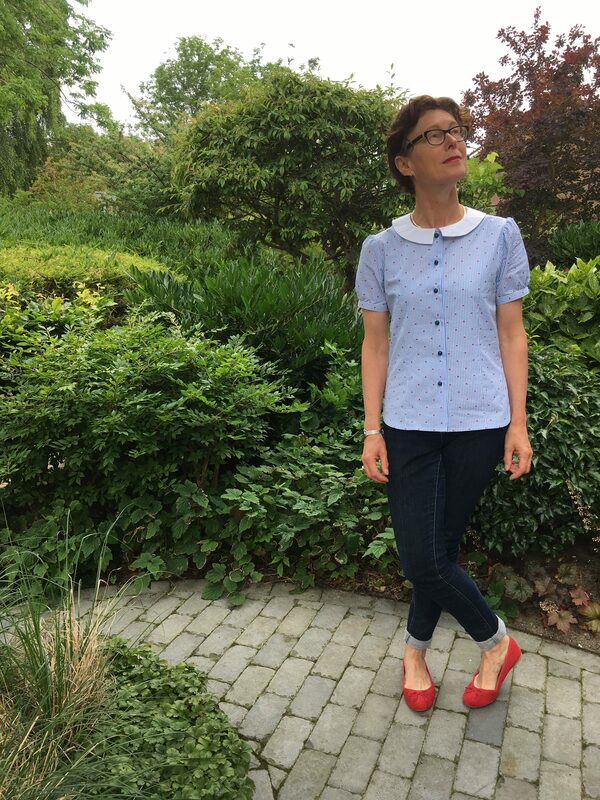 The Christine Haynes Sassy Librarian Blouse was a really popular pattern and many versions of this pattern can be found on the internet and IG. So with the challenge to make something of a company that you have never sewn from before, including muslining, pattern testing, or any fails/UFOs it was time to take this pattern form the shelf and start making it. After making three Theo overhemden for my husband I had some leftover fabric from one of them and this was the fabric I was going to use. I made a toile version and decided to make a more fitted neckline because it to wide at the back and make puffed sleeves because the shoulder seam wan’t long enough for my broad shoulders. I redrafted the back of the neckline and raised it a bit at the front. 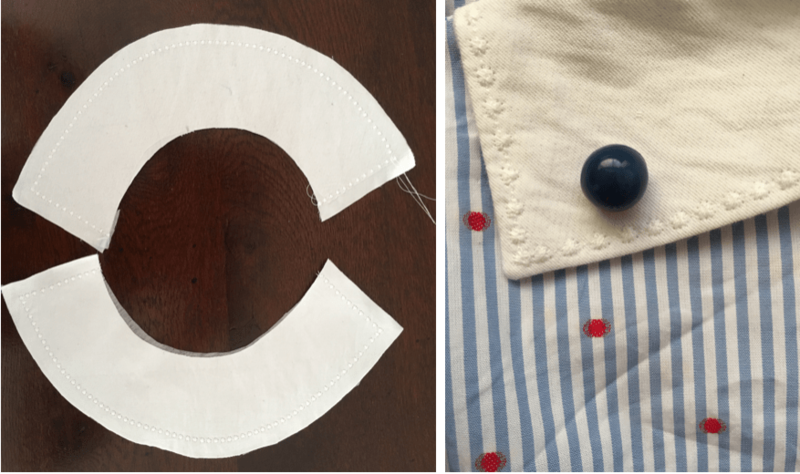 I also decided to make a Peter Pan collar and use some white fabric to make it. Everyone has perhaps a favourite detail he loves using on his homemade garments and for me it is type of collars. I started cutting the blouse and did most of the sewing. I tried the blouse on to see if it fitted but due to stiffness of the fabric the pleats gave a puffed look at he front and back. I decided to change the pleats into darts. I basted them and now the blouse had a perfect fit. Just for some fun I also so added slits in both side seams. The collar is finished with one of the decoraties stitches that can be found on my sewing machine. 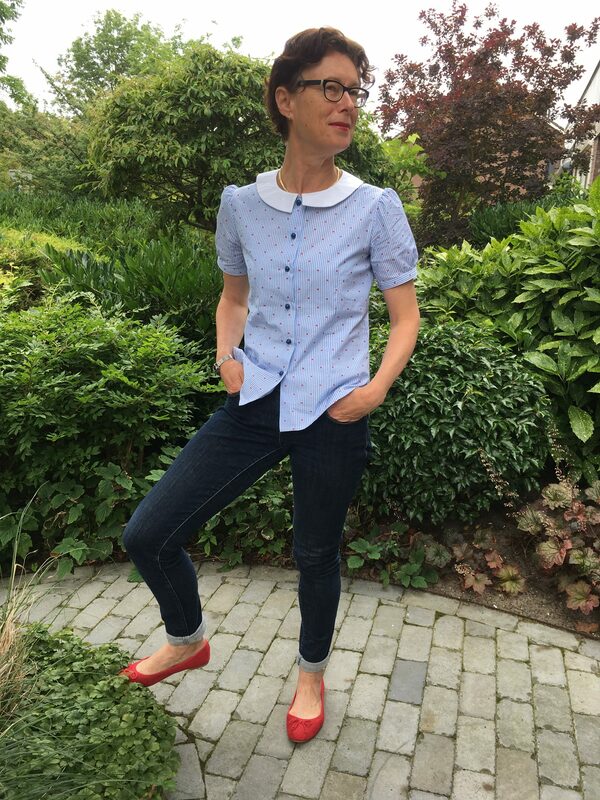 After the buttonholes were made and the beautiful (bit expensieve) blue pearl shaped buttons were hand-sewn on my version of the Sassy Librarian Blouse was ready for the photo shoot. At the photo shoot I’m carrying some just bought books. Besides sewing I also like reading books. Is there a better way to read a book while wearing the Sassy Librarian Blouse? What is my overall impression of the Christine Haynes Sassy Librarian Blouse. Next week I will show my contribution for the ‘Hack It’ challenge. Back to sewing to make a start to be ready in time before closure. Thank you so much. The alterations paid of and I’m really pleased with the outcome of my version. Amazing blouse. It fit you perfectly! Great job! As a librarian I approve of your decision to make this (and buy books)! Love the changes you made, this just suits you beautifully. I also have this pattern but have never made it yet – it was the very first Craftsy class I ever bought, and I really must follow your lead and sew it up. Thank you so much Melanie for your compliment. What a coincidence that this pattern was also your first Craftsy class and just like me you hadn’t made it. Looking forward to your version. Reading or sewing? It’s always hard to choose. This looks fantastic! I just love all the details you’ve chosen, the buttons, the collar in white with the decorative stitching – beautiful! Thank you so much. In my opinion detailing can add so much to a garment and it’s a great way to express your personal taste. I’ve wanted to make this one for a while now. Yours is very cute! Thank you so much Linda. Looking forward to your version. Very cute Sonja! Just the right balance of sass and style! Isn’t that blouse great. I made two of them so far. You did a great job! Thank you so much. I’ll take a look at your two versions. Your changes make your blouse fit so well! Great job. Thank you so much Emma. The buttons are indeed a good match with this blouse. It’s just one of those times you’re looking for buttons and see immediately the perfect ones. What a perfect top for a proper cup of coffee and a good book! 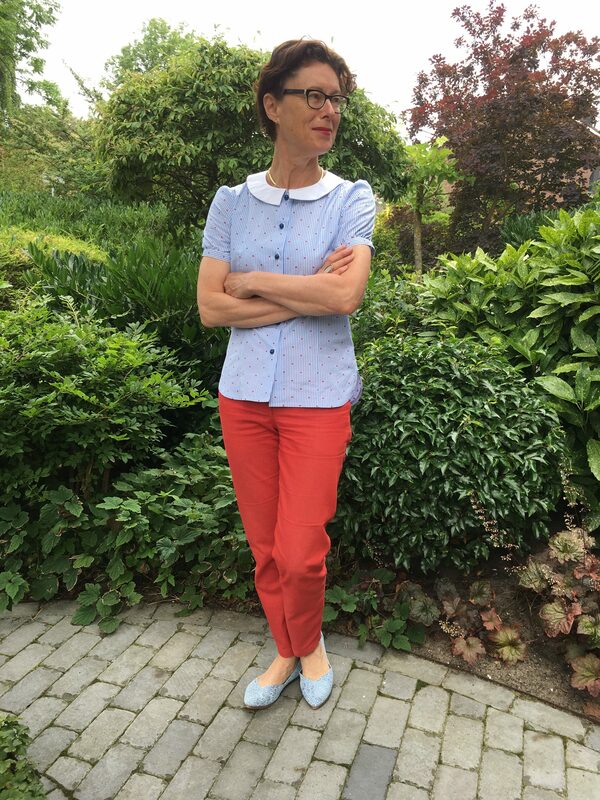 The collar is a great addition to this pattern, and I love how you’ve picked up the red of the fabric in your shoe choice! Thank you so much Elizabeth. Just like you detailing just gives garments an unique look. Although I don’t use the decorative stitches on my sewing machine sometimes they are very useful and can help you to create just that extra you’re looking for. And for my shoes: I always want matching shoes with one colour that’s in my garment. Thank you so much Miriam and what a coincidence that you were just wearing your version. I’ll check your blog to see your version.